The Gold American Eagle is the United States’ official gold bullion coin, fully backed by the government. When the 1991 1/4 oz coins were released, they had been attracting collectors and investors for five years already. Each year since 1986, the US Mint struck these coins with the same design in several sizes. Now, you can purchase a 1991 1/4 oz Proof Gold American Eagle struck at the Philadelphia mint with a PR70 grade from the PCGS through Silver.com. Gold American Eagles are always struck using only gold that is sourced from within the United States. 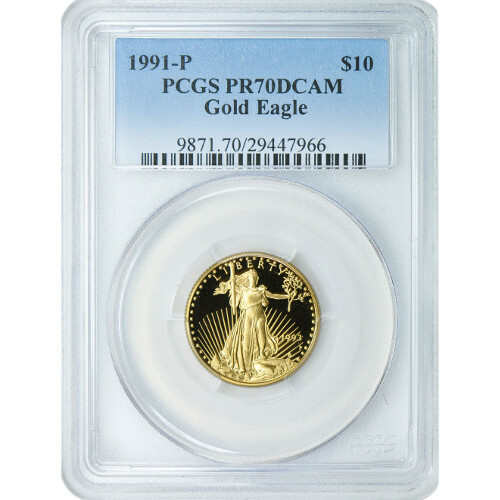 These 1991-P 1/4 oz Gold American Eagles have PR70 grades, indicating a coin which was perfectly struck by the US Mint and has no blemishes on any of its surfaces. The DCAM designation is used on coins that have a deeply mirrored, clear background field and a design overlay that is strong and frosted. The “P” mint mark identifies the coins as products of the Philadelphia Mint. On the obverse is the depiction of Lady Liberty as designed by Augustus Saint-Gaudens. First used on the $20 Saint-Gaudens gold coin between 1907 and 1933, the image was chosen to represent freedom and peace on the Gold American Eagle. The reverse displays Miley Busiek’s family of eagles. In the image, a male eagle returns to the female and hatchlings in his nest with an olive branch. If you have questions about these coins or any other Silver.com products before you place an order, feel free to call our associates at 888-989-7223. You can also connect with us online via our live web chat to get in touch with a representative immediately.